Nexus Holidays is clearly broadening its base. The company, which began by sending clients to China, now offers a number of Asian destinations, among them Korea, Thailand, India and Vietnam, and also has moved beyond Asia with its Volga River cruise in Russia. Nexus offers packages, FIT and private travel, and works with the likes of groups, students and those interested in nature and religious travel, she said. She said her employer also has an independent quality control department that randomly contacts clients and asks them if they’re satisfied with the likes of their guides, meals and vehicles. 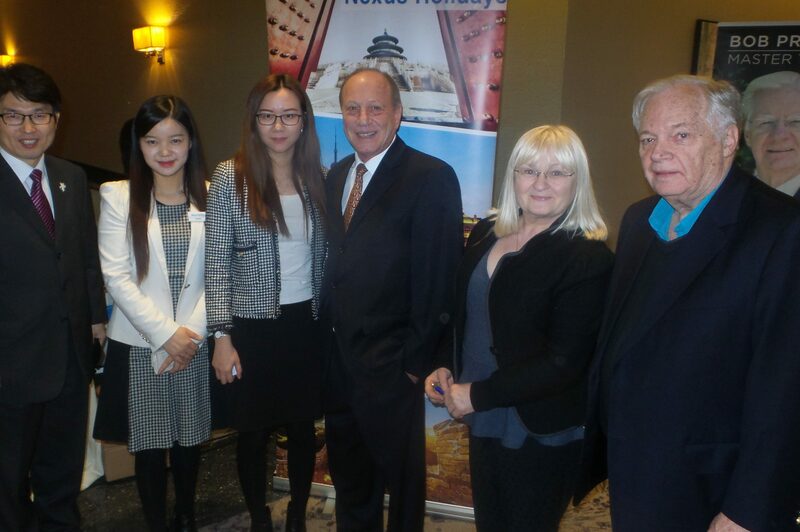 Seen at last night’s event are (l-r) John Park of the Korea Tourism Organization; Danna Guo of Nexus Holidays; Chen; Maurice Heroux of Hainan Airlines; and Milka Cook and David Pierce of Collacutt Travel.